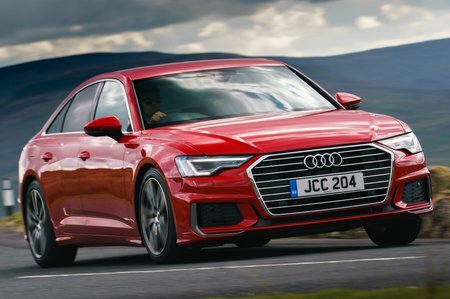 Audi A6 50 TDI Quattro Sport 4dr Tip Auto 2019 Review | What Car? What Car? will save you at least £5,337, but our approved dealers could save you even more. Entry-level Sport trim is all you really need, with electric front seats, four-way lumbar adjustment, LED headlights, 18in alloy wheels, leather seat trim, dual-zone climate control, front and rear parking sensors, ambient LED interior lighting and keyless go. The standard infotainment system includes Apple CarPlay and Android Auto, sat-nav, Bluetooth, a DAB radio, an 8.8in touchscreen and a punchy 10-speaker stereo. This 3.0-litre V6 diesel engine offers more flexible performance than the 40 TDI, proving much more powerful but remaining very smooth in delivery while being impressively hushed, with a good amount of power for hot-footing along country lanes or powering through motorway miles. It will cost a fair bit extra to buy, though.